Check out Tobi's Georgia Chambray Frayed Romper Is there anything cuter than chambray? The Blue Georgia Chambray Frayed Romper in cotton has a camisole top with a sweetheart neckline and delicate straps that criss cross into a tie loop at the back. With frayed hems, this open back romper is a charming pick for weekend brunch dates. Is there anything cuter than chambray? The Blue Georgia Chambray Frayed Romper in cotton has a camisole top with a sweetheart neckline and delicate straps that criss cross into a tie loop at the back. 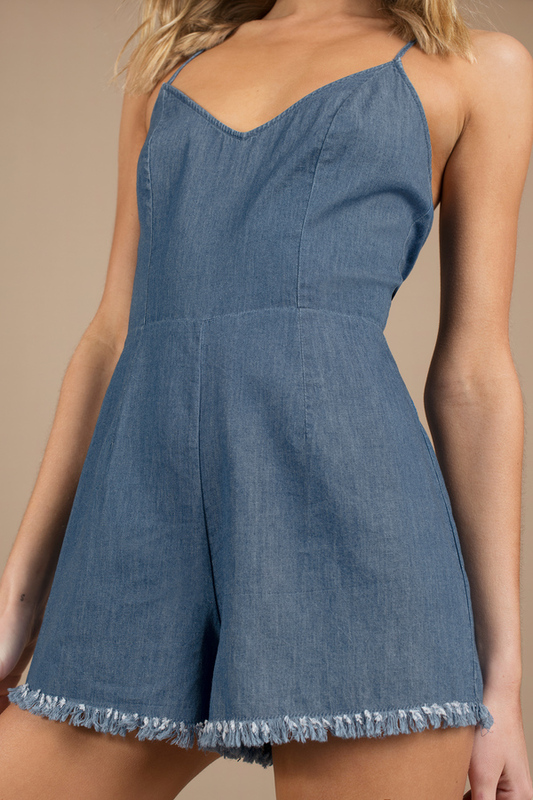 With frayed hems, this open back romper is a charming pick for weekend brunch dates.